Carla’s shocked to learn how Aidan gained his financial muscle in Coronation Street! Since coming to the financial rescue of Carla (Alison King) in Coronation Street this summer – whether she liked it or not – Michelle’s cousin Aidan Connor (X Factor winner Shayne Ward) has helped keep the Underworld factory afloat after fragile Carla’s gambling spree swallowed vital business funds. But how exactly did the confident businessman acquire the investment money? And now hands-on Aidan has his feet comfortably under the desk at Underworld, will all go smoothly with the undies factory or is there further drama to come when Aidan’s past endeavours emerge? As Carla works on a tough client, she’s unimpressed by a distracted Aidan, who keeps ignoring phone calls from his dad, Johnny. Later, Carla’s stunned when Johnny barges into their office! Carla’s further shocked when it becomes clear that Aidan lied about where he got the investment money from to buy into the business. When Johnny reveals where Aidan really got his cash from, will Carla end things with her business partner or will she find Johnny now has a vested interest in Underworld too? 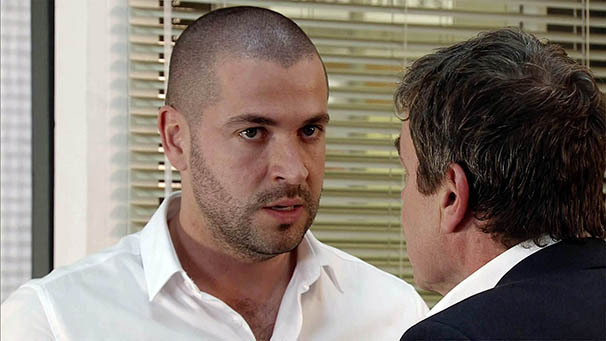 A defiant Aidan vows to make a success of his Underworld investment regardless of where the money came from. Will Johnny and Carla agree with him, though?